The ego. An elusive but dominating force. It sneaks up on us and takes control of our thoughts, words, and behaviors in a wink of an eye. I have had many discussions with clients, friends and family about the importance of understanding one’s ego. I have been trying to understand mine for a long time. The persona of my ego is a ninja. It is shadowy, elusive, potentially dangerous but never far away. When the conditions are right my ego-ninja takes control of the wheel by hi-jacking perceptions, emotions, rational thinking and behaviors. Often the agenda of my ninja are at odds with my true objectives. Please let me provide a little background information for the recent conditions which made a coup attempt perfect for my ninja . My family, like many families, has suffered a great deal due to alcoholism and substance abuse. If you have or have had substance abuse in your family, you know that it is the bad gift that keeps on giving through the years and sometimes, sadly through generations. The conditions could not have been more perfect for my ninja ego. It’s summer and I’m at a pool party. An acquaintance, I will call Dean, is drinking shots of Jack Daniels. And…as people do when drinking Jack Daniels…. Dean is becoming obnoxious and loud. A group of vibrant 20 year old girls are at his table. Dean tries to convince the young women to drink shots with him. None of them do thank goodness. However, Dean was perfectly modeling a crash course in Binge Drinking 101. Responsible Drinking 101 is the course that would benefit the young women. Not to mention Dean’s is breaking the law. And, not to mention, maybe the families of these young women would like to be the ones who introduce them to alcohol by modeling responsible drinking ie Now that you are legal drinking age, would you a glass of wine with dinner? Your ego has ninja qualities too. Look for them. Understand them. 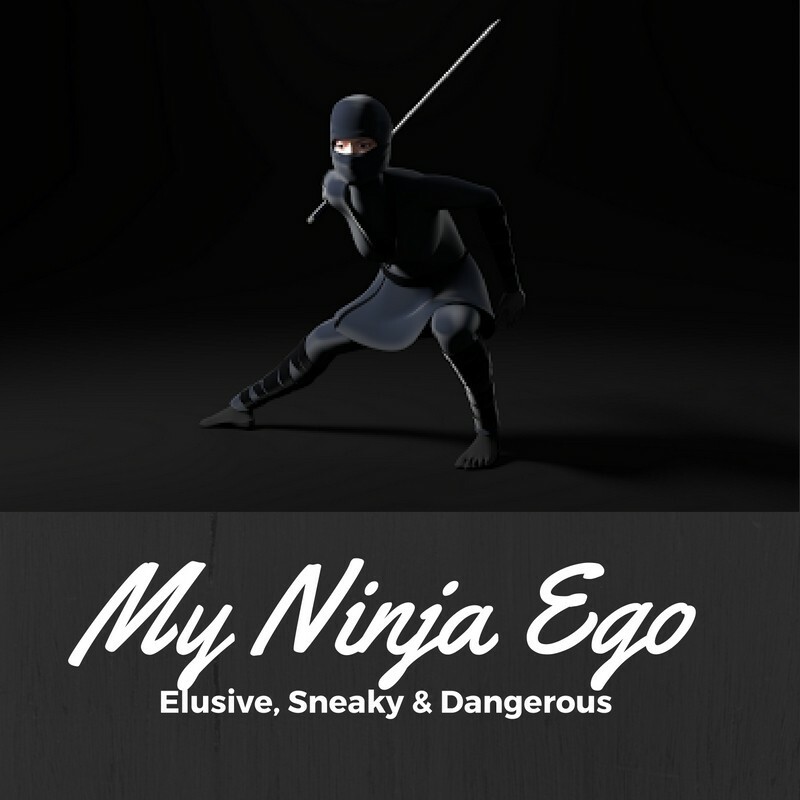 What makes your ninja ego plan a coup? To answer this ask yourself, what do you defend? Is your existence or worth based on some idea of what it is to be a good man/woman, Republican/Democrat, vegetarian/meat-eater, victim, Protector of Young Women? When anger, frustration, judgement, intolerance arise, your ninja ego ninja is close by. She is elusive. She is in the shadows, but she is there. Before you know it your good intentions are vanquished. The most interesting aspect of this experience was the subtle nature of ninja. I barely saw the true intentions, which were to make Dean feel bad, and for me to feel superior and smarter. It was if ninja ego was somewhere, very, very far back in my subconscious mind. I know you are there ninja ego. I am watching out for you.